One hundred years ago this week, Harry Elkins Widener, Harvard class of 1907, wrote this letter to his friend and advisor Luther Livingston. 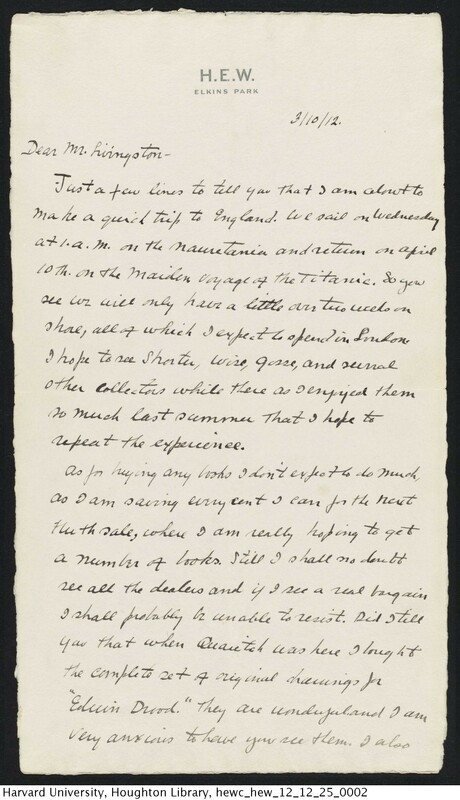 He begins: “Just a few lines to tell you I am about make a quick trip to England. 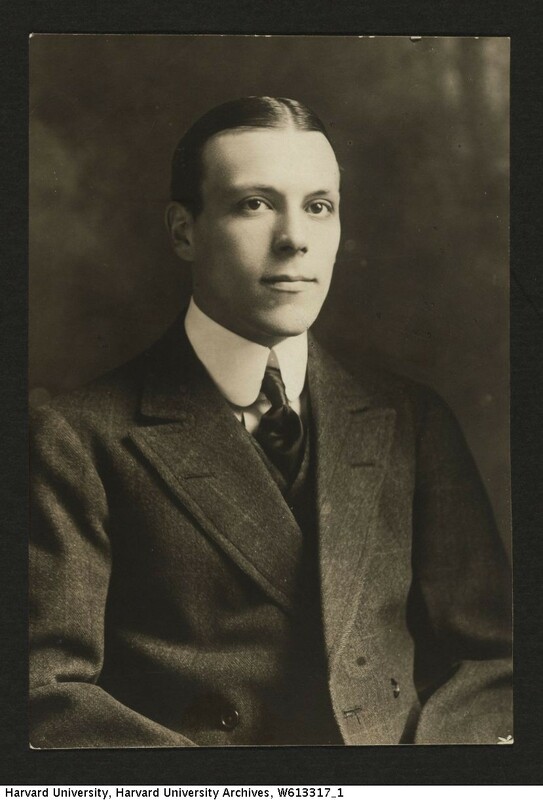 We sail on Wednesday at 1 a.m. on the Mauretania and return on April 10th on the maiden voyage of the Titanic.” Tragically, Widener did not make it home as planned, one of the many who died when the Titanic sank on April 12th, 1912. Widener’s mother, Eleanor Elkins Widener (later Rice), granted the wishes expressed in her son’s will that she give his books to his alma mater: “whenever in her judgment Harvard University will make arrangements for properly caring for my collection of books, she shall give them to said University to be known as the ‘Harry Elkins Widener Collection’” Mrs. Widener not only gave the Collection but funded the building of the entire Harry Elkins Widener Memorial Library, which still serves Harvard’s flagship library. I hope to see [Clement] Shorter, [T.J.] Wise, [Edmund] Gosse and several other collectors while there as I enjoyed them so much last summer that I hope to repeat the experience. As for buying any books I don’t expect to do much as I am saving for the next Huth sale where I am really hoping to get a number of books. Still I shall no doubt see all the dealers and if I see a real bargain I shall probably be unable to resist. Did I tell you that when Quaritch was here I bought the complete set of original drawings for “Edwin Drood.” They are wonderful and I am very anxious to have you see them. Widener did visit many collectors and dealers while in London and was indeed unable to resist making several purchases including a 2nd edition of Bacon’s Essays (1598) which is said to have perished with its owner. Widener did not, of course, make it to the Huth sale that he mentions here, but everything on his list of desiderata was purchased by his family in his memory. 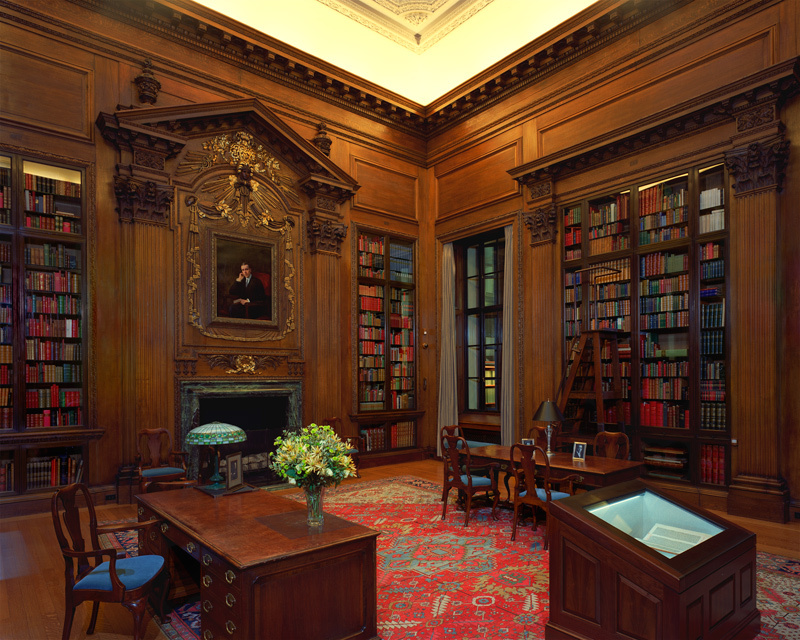 Widener’s volumes all now reside, Edwin Drood among them, in the Memorial Rooms at the very heart of Widener Library. Near the end of the letter, Widener imparts “a secret”—“grandfather has bought the Hoe copy on paper of the Mazarin Bible. Is it not great? I wish it was for me but it is not.” This copy of the book more familiarly known as the Gutenberg Bible did come posthumously to Widener, given to the Collection by Widener’s brother on behalf of his sister in 1944. One volume of the Gutenberg Bible is permanently on display in the Library. 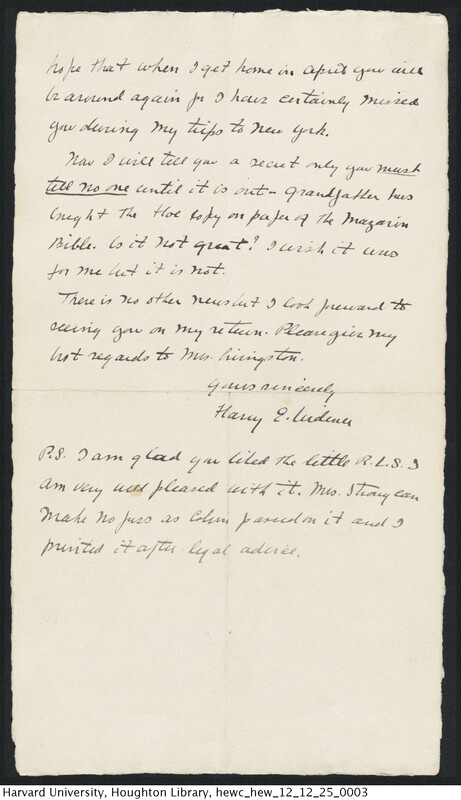 In Widener’s final postscript he writes: “I am glad you liked the little RLS. I am very well pleased with it….” This refers to Widener’s printing of Robert Louis Stevenson’s “Memoirs of Himself.” Widener owned the original RLS manuscript and, in January of 1912, he had of 45 copies printed for private distribution. One of the 45 had clearly been given to his dear friend Luther Livingston. Three other copies remain at Harvard. If traced, the other 41 owners might constitute a Who’s-Who of bibliophiles at the beginning of the 20th-century. 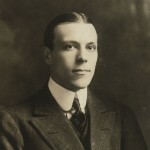 To learn more about Harry Elkins Widener please visit our website. To learn more about the impact of Widener’s tragic death on the field of rare books and manuscripts, please see the current exhibition at the Rosenbach Museum and Library. Very interesting. 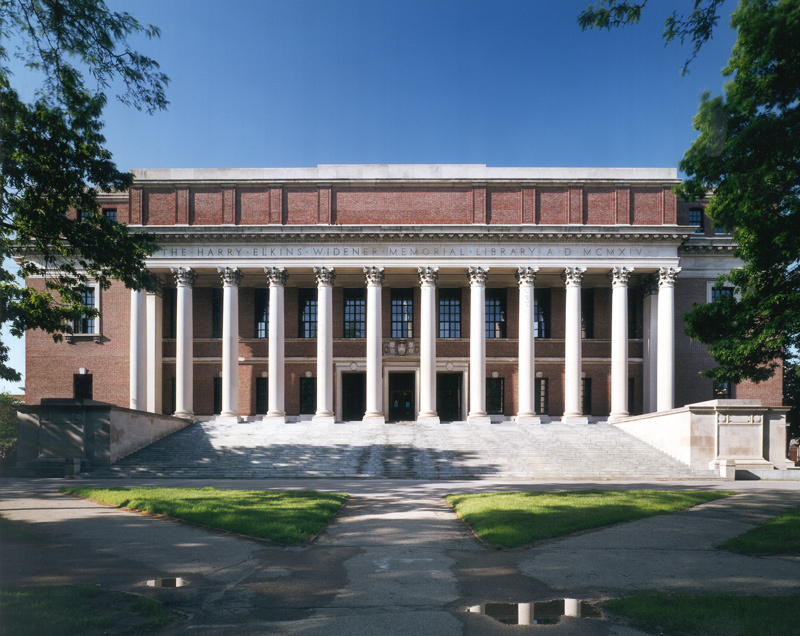 The next time we are in Cambridge we will have to visit the Widener Library.